If I could only eat one more food, everyday, for the rest of my life, it would be pizza. And I feel blessed to live in a city where there are so many pizza possibilities, the downside of which is an over-saturation of mediocre pizza within Manhattan. As a result, I focused my attention on Brooklyn and what better way to do it than by trying as many as pizzas as I can. I’m already on a mission for NYC’s best wings, so how about Brooklyn’s best pizza? And what better way to start than a mini pizza tour: three places, three people, three delicious pies. Which one is modeled after the famous DiFara’s? 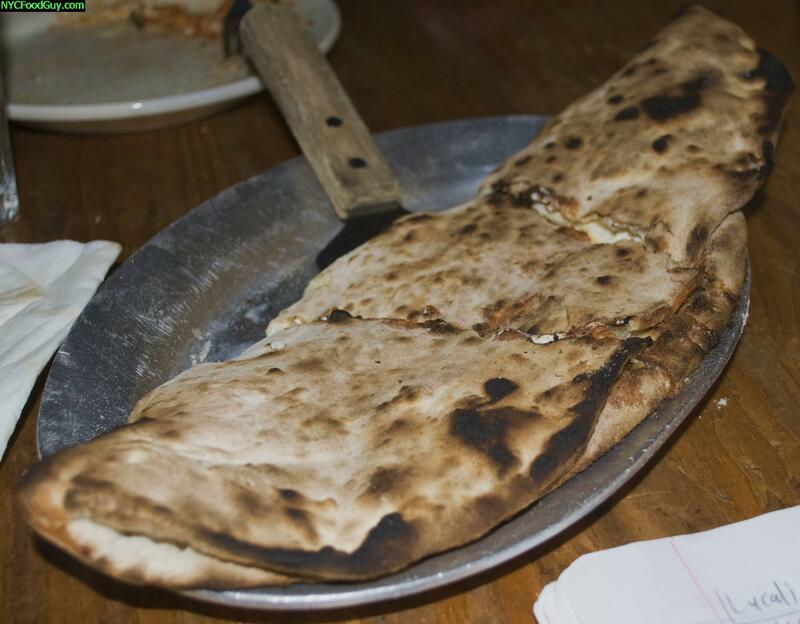 And on a day of pizza, did a 5-cheese, secret recipe calzone steal the show? To answer the question everyone is asking, no, Grimaldi’s is not worth waiting an hour for. 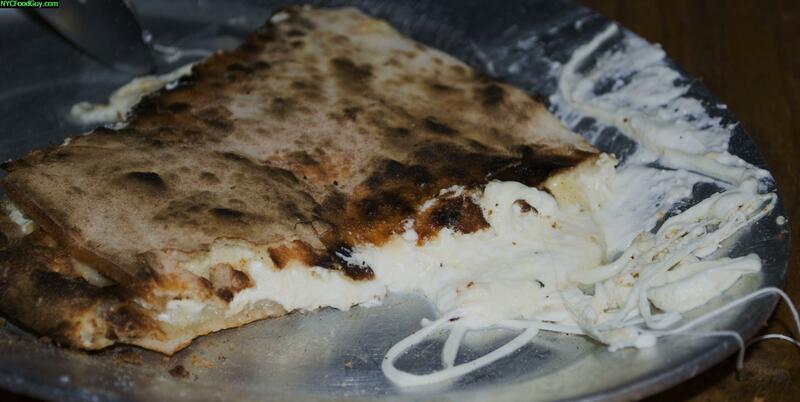 Its coal oven pies are very tasty and topped with homemade fresh mozzarella and San Marzano tomatoes. But for all the old school Italian feel of the red and white checkered table clothes, the green, red and white uniforms, the maps of Italy, and the manager you wouldn’t want to owe money to, this is more a pizza factory than a pizza restaurant; the experience is less about customer service and ambiance as it is about churning out pies and turning over tables for tourists and non-city dwellers. Service is inattentive and once the check has arrived, $16 for one unevenly cooked pie, you better be ready to evacuate your table so the next party can be seated. Disappointment focused on the haphazard construction of the pie. Poor sauce and pepperoni dispersal ($2 per topping, half or whole pie) made for awkward slices. Your best bet for decreased waiting time and attentiveness is to go after 7PM, that way you also miss the re-building of the fire, an event which takes place between 4PM and 6PM daily and could extend your wait time an extra 30 minutes if you happen to be on line while it takes place. Another unfortunate side effect of the fire re-building is that pies which emerge from the 850 to 1,000 degree coal oven may arrive slightly undercooked, as I encountered, resulting in a dough that’s denser that one would expect from a coal oven. Grimaldi’s, which surprisingly has only been open since 1990, is good but not great. If you want coal oven pizza without the wait and the trip to Brooklyn, check out one of the two Angelo’s locations in Manhattan, just don’t order delivery. Let’s be honest, Brooklyn is hip. It’s hip to live there and hip to eat there. It’s what the Lower East Side used to be. And franny’s is the hip place to eat Italian food, from the lower case “f” in the name to the environmentally conscious mantra. Despite the pizza being the most famous menu item at franny’s, it’s telling that its not even mentioned on the introspective “Who We Are” page of franny’s website. Maybe it’s because franny’s is an Italian restaurant that serves pizza, not a pizza restaurant that serves Italian food. Pizza may be the dish that brings in curious outsiders, but I didn’t get the sense that it is where the restaurant’s pride lies. The surprisingly small pie ($15-$17 average) arrived on the table uncut and doused heavily in olive oil. As if it’s not troubling enough trying to cut pizza fresh out of a wood-fired brick oven, with molten cheese and brightly flavored tomato sauce daring my fingers to dive in, I was stuck contending with a thin and flimsy crust that did not aid in the slicing process. 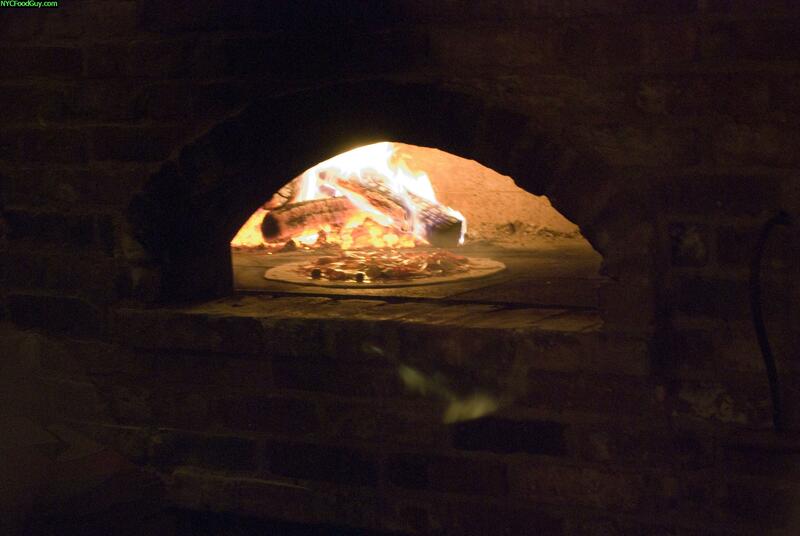 The smell of burnt wood emanating from the brick oven dominated the restaurant and our pie. If I wanted to combat the flimsy crust by ordering my pie well done, I’d be wary of an over-smoked pie. The one bright spot was the touted house-made sausage, which lived up to its billing, it was garlicky and delicious. I’m not going out of my way to return to franny’s, but if I do, it would be for the waitress-recommended clam pie and for a chance to dine in their spacious backyard garden, open from spring to the end of September. 575 Henry St. nr. First Pl. The hype for this BYOB Carroll Gardens newcomer has been varied and plentiful, it’s been called mysterious, soulful and wonderful. I just call it damn good. Although the wait for a seat in the dimly-lit single-room may be inordinately long (45 minutes to an hour and a half), it’s worth it for a pie ($18) which resembles one you can only find at another Brooklyn landmark: the legendary DiFara’s. Brooklyn-native Mark Iacono, the owner and main pizzaiola, models his pie after the legendary Dom DeMarco’s. Working mainly by candlelight, surrounded by ingredients and a cavernous brick, wood-burning oven he built himself, Iacono rolls his dough with wine bottles before spreading a layer of secret recipe sauce over the thin crust. Buffalo mozzarella, low moisture fresh mozzarella and parmigiana-reggiano follow before the pie is baked by the mesmerizing fire dancing off the burning logs of wood. Upon emerging from the oven, the pie is sprinkled with grated Grana Padano, freshly shaved Parmesan cheese and a few sprigs of basil. The marriage of texture and flavor is complete, resulting in a pie whose sharpness and creaminess balance each other. The crust, unlike franny’s, is light but exceedingly crisp and floury. The cheese is the star, especially the slices of fresh Parmesan melting into the hot mozzarella and sauce. Pepperoni (toppings are $2 – $3.50), brought in from local landmark Esposito and Sons Pork Store, is spicy and burnt around the edges but the plain slice is so good, I would suggest trying the pizza topping free to start. Just as taking a risk in purchasing this former candy shop with no intended purpose and no pizza-making skills has paid off for Mr. Iacono, trying his calzone is a risk that’s all reward for you. While the crust on the pizza is underwhelming, the same crust is fantastic as a home for the 5-cheese calzone ($10 small, $20 large). Thin, light, crispy, slightly smokey dough encases creamy buffalo mozzarella, ricotta and low moisture fresh mozzarella plus parmigiana-reggiano and a secret 5th cheese. The obligatory side-serving of tomato sauce is unnecessary because the flavor of the calzone is awe-inspiring enough on its own. Its greatness lies in its contradictory nature; creamy and stringy, salty and slightly sweet, all the differences melt in the heat of the oven to create a pocket of deliciousness. Lucali is better than franny’s and Grimaldi’s not just for its food but for its atmosphere and the warmth of the experience. Once you survive the wait, you enter what feels like the cozy home of a friend who would let you stay as long as you’d like, especially if you keep letting them cook for you. So be friendly, ask for Mr. Iacono, and tell him you heard the pizza’s good but the calzone is great. NYCFG – you nailed it. But, damn, now you’re gonna have folks inundating my neighborhood making it harder for me to get into Lucali’s. Did i miss something? How is there no mention of L&B? As someone whose round belly indicates an overabundance of pizza consumption, I can say with certitude that Lucali’s far surpasses Grimaldis. It is second only to Di Faro’s in the pantheon of Brooklyn pizza joints. I must say, as someone whoswde blood flows with the olive oil of Southern Italy, that the Bronx has several pizzerias worth mentioning. IN the real little italy, the classic standard is Full Moon. Two friends from Naples run the place and it oozes Italy. The attitude of the men and the atmosphere of the place takes all the diners back to streets of Napoli. Another darkhorse for best pizza in the city is Coals on Eastchester Road in Morris Park. These people finally did something that Italians have secretly been doing for hundreds of years, they GRILL the pizzas. That is right, the barbecue on the pizza is not chicken (BTW, no self respecting foodie would EVER put barbecuse chicken on pizza), but the pizza itself. ANyone who has ever been to a legitimate Italian barbecue knows that nxt to the frying pan of sausage and peppers on the grill is usually a pizza. Finally, another great place is zero otto nove. Roberto Paciullo, owner of the best Italian joint in the city (Roberto’s) puts a Salerno twist on his delicious pies. When you go, try his desert pie (made with Nutella). Please try these three and compare with the Brooklyn ones. If nothing else, they will be equally as good for a third of the price. 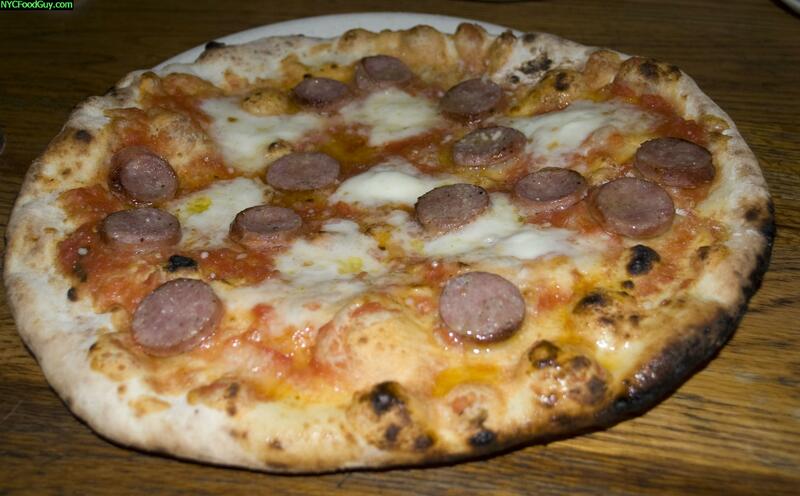 One more thing, growing up in an Italian home, we always saw Pizza as comfort food. With that said, no person on earth should ever wait 45 miuntes for a pie, even if the good Lord himself is in the kitchen baking them. All of these places will have you seated in a resonable amount of waiting time. Go and enjoy, but leave the barbecued chicken for Daisy Mae’s or Dinosaurs. They’re super-friendly, but don’t think they won’t get (understandably) antsy if you linger after you’ve finished eating. Hmmm I am going to have to disagree with you on Grimaldi’s. I haven’t been able to find a salty crust like theirs anywhere else! You are correct about their lack of toppings but any more would make their thin crust tear. Yes, yes, we all love Lucali’s and yes Marc is like the nicest (and cutest) pizza maker out there. Next stop for you is going to have to be DiFara’s. Let me know when you go. I’ll join you! There’s also a bar called Cherry Tree on 4th ave in Park Slope. They make a mighty salty and delicious pizza. I believe if you go before 6 you even get one free with the purchase another. Although, they may have ended that promotion. It’s been a while. I do recommend checking it out. It’s not typical but it is pretty tasty. Food Guy, you must have your hands full with all these challenges! Although I’m inclined to agree with Ian…I don’t recall an official post regarding L & B’s Spumoni Gardens on this site. Granted, a lot of us in the food community would encourage you to try it again (perhaps in Part 2), but how about the desserts at some of these places? Nothing washes down an upside-down sicilian like a Spumoni-flavored Italian Ice. Hope your holidays go well and looking forward to more eating in 2009. Let’s plan something if you’re down. Shoot me an e-mail if you want. Thanks for the advice on Brooklyn pizza. I wanted to second garlicandgaelic in saying that the Bronx has some amazing pizza options as well. Zero Otto Nove ranks among my top 3 in the entire city. Visiting Arthur Ave is a great food experience to follow up a day at the Zoo. As a student at Einstein, just across the street from Coal’s, I can also second the love for Coal’s. Aside from the grilled pizza, which truthfully took some getting used to, the atmosphere and beer selection is excellent as well. Coal’s also does great daily soups and delicious burgers. That all looks so good… Jealousy, jealousy. I can’t wait to check out Lucali’s! Well put on Grimaldi’s. 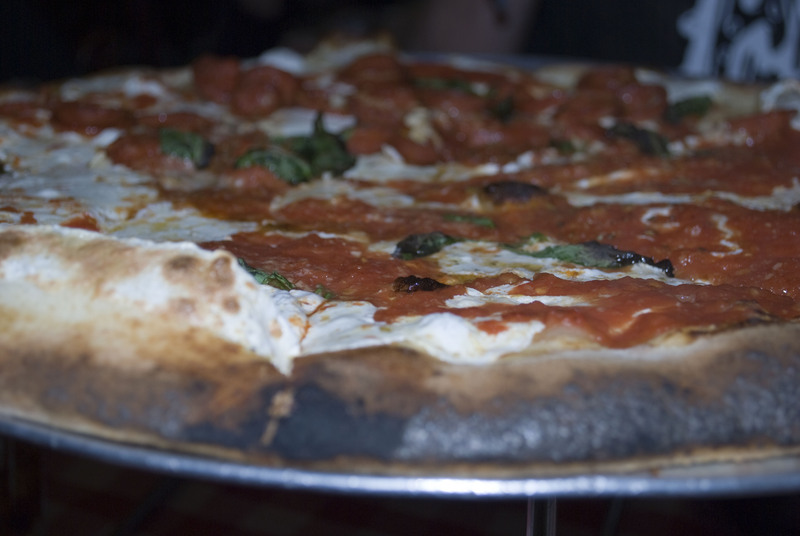 If you do by the slice in Bklyn, a great place is San Marco’s on Lorimer St. in Williamsburg. Right on brother. So that’s where you were during Thanksgiving break! 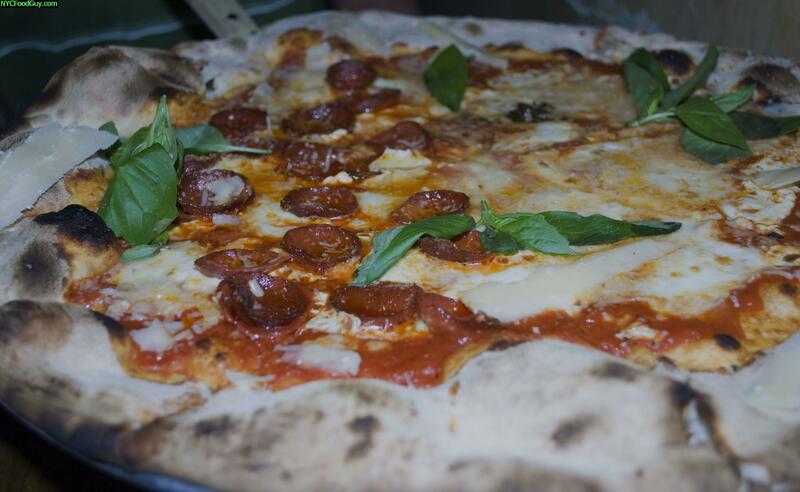 Wish you had taken more photos to give us a real Italian pizza tour. Looking forward to the next leg of our BK tour though. Sorry FN, hopefully this won’t change the wait time too much at Lucali, after all, how much worse can it get? The best bet for you is to just do take out. Thanks for the kind words. Any other pizza places in BK you’d recommend for next time around? That’s the right attitude. Only franny’s was an underwhelming experience. Where do you get your pizza sarahspy? This is just part 1 of the BK Pizza tour. Don’t worry I didn’t forget about L&B, just didn’t have time to get to Bensonhurst during this trip. Want to come along for L&B next time? I can almost taste those delicious upside down Sicilians. As if I haven’t been pining for a Bronx experience allready, your review just reinforced my need to check it out. Having heard about the wonders of Bronx food from you before, I have my work cut out for me. If you were me and were making a Bronx trip, what three to 5 places would you absolutely go to? Have you had the burger at Coal’s? I hear that’s good too. I genuinely felt like I could have sat at Lucali all night chatting with Mark about pizza and trying more food as it came out of the oven, maybe it was because I was snapping a bunch of photos. Either way, the wait was ridiculous, I have to agree, but we were able to drive to franny’s and put our name on that list and then get back to Lucali with time to spare. It’s all about making the time pass. What’s unique about the pizza at Cherry tree. 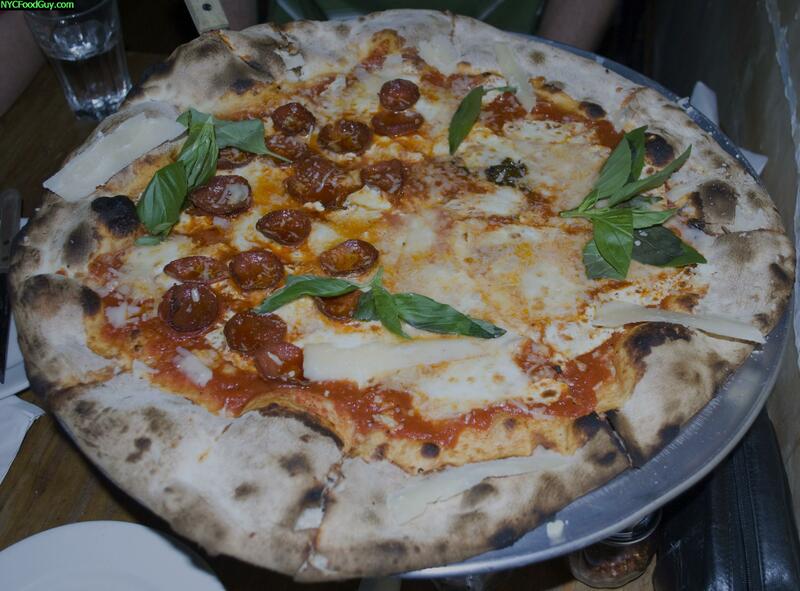 Would you rather wait for a pie at Grimaldi’s or Lucali? As I said before Mr. Master, this is just part 1 of my BK Pizza tour. I’ve been to L&B and I second the motion of deliciousness. Those upside down Sicilians are awesome. The spumoni is great too, I had a taste. You know I’m a big dessert guy but I’m always looking for new stuff, where are some of your favorite desserts? CLAM PIE TOUR? I’m sold. The real clam pie is at Don Pepe’s in Connecticut but NYMag did a little roundup of claim pies a few months ago so we’d have a good starting point. I’m definitely down for a BK Food extravaganza after the New Year. Let’s be in touch. There it is, Coal’s does have great burgers. Have you been to Piper’s Kilt? I haven’t been to the zoo in ages, I hope I get to Arthur Avenue to eat before the zoo opens up again. Where do you like to eat on Arthur Ave, if you had to focus on a few places which would you hone in on? There’s no great pizza where you’re from? Thanks for the Williamsburg rec. I haven’t had much food there, do you have any other recommendations for good stuff? Is San Marco’s a slice joint or an actual pizza restaurant? Knew you would like the sound of that, it’s a shame actually I’ve never had Don Pepe’s. We will chat after the New Year. Have a great relaxing, food-filled holiday. I genuinely felt like I could have sat at Lucali all night chatting with Mark about pizza and trying more food as it came out of the oven, maybe it was because I was snapping a bunch of photos. Probably depends. The last time I was there, with a party of 6 or 7, they politely asked us to settle up after we had finished eating and were working on our 3rd or 4th bottle of wine. It wasn’t a big deal. Did you really get to Franny’s and not make it to Wing Wagon? You’re only punishing yourself. My next trip is Lucalli’s I sure hope you guys are right about this one!! holy crap i was watching daily news live tonight and saw you on tv food guy!!!! you are so much hotter than i imagined! how are you not fat?!!? You were on TV?? What were you interviewed for? latkes! i saw the re-run at 11 last night, you were amazing food guy. this begs the question though, where can we get good latkes besides our grandmother’s house? What the heck is a latke?? I actually happened to catch that too, the food guy even brought napkins. That was awesome! How come no sour cream? sounds good, thanks Miss L! Mister Latke – I’m well aware that latkes are all about the apple sauce. It’s just that sometimes they are often served with sour cream too, as NYCFG indicated on TV. He just didn’t have any sour cream at the time. I bet Chris Cotter would have loved some sour cream. What do you think NYCFG? I’ve looked all over, fellow posters, PLEASE post any link to the Food Guy on TV! Having said that, not to go off-topic again, but do you eat cheesecake, Food Guy? If so, you must’ve heard about Juniors (which is in Brooklyn, so it fits the pizza quest as a nice ending). Food Guy – Are you a fan of Chinese Dumplings? If so, where can I get the best in NYC? Thanks Phil, I came across that page while scouring the internet…no luck unfortunately. I even emailed SNY asking if they would post the video, but no response. Oh well. I would imagine NYCFG could post a link, no? post it foodguy we all wanna see it!! What’s up everyone? Thanks for the enthusiasm over my appearance on SNY’s Daily News Live. I’m working with them to get a hold of the clip which will I can hopefully post on here soon. As far as Dumplings go, I’ve heard a lot of good things of recent about Prosperity Dumplings on Manhattan’s Chinatown. It’s a small cart and they also sell bags of 50 frozen to bring home. NYCFG, just had the Bussaco clam pie. Not bad for $10. Clams are served in the shell ontop of a somewhat thick, very garlicky pizza. Roughly sliced it was good, best part was pouring the clam juice onto the pizza. cohnballs is on the money!!! This is hands down better than Grimaldis but do yourself a favor and make this trip, if you go to any of their other locations, you will be disappointed and never make it to the original one. This place is amazingly good, and is endorsed by the Ramones “nuff said! You’re an animal. Pouring the clam juice on the pizza. Big moves. Reminds me of Philip Seymour Hoffman in Along Came Polly pouring Ben Stiller’s extra pizza grease on to his slice. Dude you’re spot on. Totonno’s is truly amazing. I’ve only been there twice but both times it was killer. 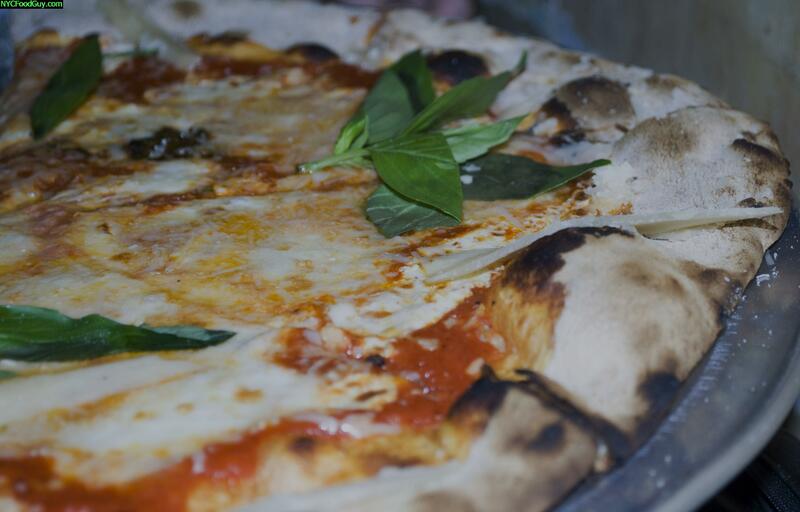 Classic coal oven pizza, light, airy slightly charred crust and bubbling fresh mozz with a bright, delicious sauce. Definitely worth the trip to Coney Island. Hey Foodguy, any updates on the SNY Daily News clip? Sounds good man. I’ve been pretty busy with work lately but we’ll figure something out. We need to do some Brooklyn action. Maybe Brooklyn wing tour? I’ve been trying to get the clip but it hasn’t been as easy as I thought it would be. I’ll keep you updated though. I hear ya, it’s been busy for me as well. I’m thinking we do something after the Super Bowl. I could get down with a BK wing tour. Or maybe even a taco tour? Taco tour I could definitely be down with. Sunset Park? I like the idea of a taco tour. I have yet to explore the Sunset Park area so this would be a good excuse. Perhaps throw in a few Park Slope/Prospect Heights/Crown Heights spots for good measure? I’m definitely down. Some weekend after the Super Bowl? of state street and court that is just unbelievable. it’s worth the trek and only $2.25 a slice. What’s the name of the place? Only Heights spot I’ve been to is Fascati on Henry b/t Orange and Pineapple. Do you remember the name of the Williamsbug spot? Guy: Spot on about Grimaldi’s. I went twice because it was like a double take. Couldn’t believe how bad the service was, I had to go back to make sure it just wasn’t a bad day. When I asked the server “can you explain to me the difference between the medium and large calzone” she said … “the size”. I was stunned. I would never thought of that. I was actually thinking of a more descript response such a dimensional variation or a weight variation. She hit it on the head! Medium is sized very differently from the large. That answer clarified things so well for me that she learned what the difference was between a small tip and no tip. @Chef, what kind of inane question is that to ask in the first place? I think MOST if not ALL waiters/waitresses working in a fast-paced restaurant like Grimaldi’s would have said the same thing. FoodGUY! time to UPDATE: Franny’s for what it is beats both lucali and Grimaldi’s. Now maybe in one sense, the one I’m choosing to ignore, that this a strict pizza review, it’s arguable Lucali does have a better pie, but for value, service and variety there really can be no comparison. Franny’s does suffer from a slightly inflated ego, most of their portions are small, but the quality is never questioned, and the affordability of the wine list, strong beer selection and garden all combine for what is a pretty enjoyable experience. I’ve had a few overdone pies, and the uncut thing is ridiculous, never was a “cool” brooklyn idea, and can be annoying when sharing. But clam pie is killer, and you get pre-roberta’s special toppings like ramps and other goodies (now Roberta’s has overtaken that effort as of late) Now Lucali’s super ego-driven, and I can’t see how that can be separated, from the food, just like when we talk about all the love and passion that you can “taste” Well, I can taste the $30 dollar plus pizza, I can taste the nerve to charge a corkage fee in a BYOB establishment, which they did’t originally do btw. All that on top of a 1 plus wait… I went a ton 6-7 times over the first 7-8 months, and we had some inconsistent pies in the mix, just like anywhere else. I haven’t been back in 2 plus years, and his 2nd place is more than just on the way, maybe I’m due, but I can’t get past the aforementioned. Finally, despite the reality of Grimaldi’s lack of much of anything authentic, I have almost consisently been blessed to have always have stellar pies there. After many trips of just pepperoni or plain we tried mushrooms, they were pleasantly fresh mushrooms, appeared to be cremini or similar, and this was impressive. Yes I was rushed, felt like a tourist, and everything else you mentioned, but bottom line, it was simply well worth it! I’d go back there any day before DiFara’s. Yah, I busted the holy grail!! Why should any pizza ever need that much frickin cheese and olive oil?? The crust was excellent though. And any geezer trying to say LB Spumoni is any good is only remember 40 years ago, cause it is downright lousy! Hey, let’s get out to the new and improved and redecorated post-fire Totonno’s, now that could be something….! UPDATE: This just in, Guissepina’s in Greenwood Heights is open: Sister resto from Mark Iacono’s brother (Lucali) finally opened. Dimly lit but comfy spot on 22nd and Sixth.. basic pie runs 18 or 19 plus 3 per topping.. pretty good pie all in all, sauce was good, cheese too, a solid pie. Too much fresh basil for my taste and all that sprinkled cheese ala DiFara is too much as well… It’s a pie I’d go back for I think. But, despite the distant nabe and even quiet- less than crowded room, even on Sat night, a one top pie, and one glass of wine with tax and tip was 39 bucks… Yikes! what has this pizza world come to? I would argue that Toby’s Public house, practically across the street has equally good pizzas,(wood buring oven) and better array of toppings i.e speck, prosciutto and more, and of course, a killer beer selection. I think the best new pie out there is from Best Pizza, the relative new comer from the Roberta’s crew.. they have a White pie that is Sicko! So frickin good..!! and for your travel efforts to get over there, Momofuku commissary is less than a block away for dessert! And last but not least: Totonno’s Coney Island: I finally made it here after 12 years of eating pizza around the city, This place ROCKED! The best crust hands down I’ve ever sunk my teeth into… pure heavenly bliss… Worth it 10 times over.. Seriously pizza fans, the balance of toppings, stiff but plibale crust with perfect crunch to “stretchy” mixture… This pie as an experience easily took down Difara’s and most of the five family crew.. (Patsy’s, Lombardi’s etc) by experience I mean that moment in mid-bite where the world disappears and the perfect array of flavors and textures descend into your mouth and you are left speechless… On that day, Totonno’s took me there!